While we wait to get our hands on the D7500, Nikon has announced three new wide-angle lenses. First up is the AF-P DX 10-20mm f/3.5-5.6G VR, which is designed for DX-format (APS-C) DSLRs like the D3300 or D5600 and sits alongside the ageing AF-S DX 10-24mm f/3.5-5.6G ED and AF-S DX 12-24mm f/4 IF-ED in the Nikon range. This compact and lightweight wide-angle lens gives a focal length equivalent to 15-30mm on a APS-C format Nikon DSLR, allowing you to shoot wide and expansive vistas, as well as exaggerate perspectives with ease. The lens features Nikon's new(ish) Pulse stepping motor technology (denoted by the AF-P designation) to deliver what the company promises to be faster and quieter autofocusing than its predecessors. The AF-P DX 10-20mm f/3.5-5.6G VR also sports Nikon's Vibration Reduction anti-shake system, which promises up to 3.5 stops of shutter speed compensation. Available from June 29th, the AF-P DX 10-20mm f/3.5-5.6G VR is expected to be priced at $309.95/£329.99. Australian pricing is still to be confirmed. 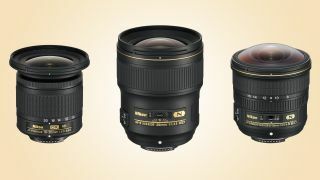 The AF-S Fisheye 8-15mm f/3.5-4.5E ED is one of two new FX-format full-frame lenses Nikon is announcing. With a circular fisheye design, the lens delivers a full 180° horizontal and vertical view at 8mm, with the image projected as a circle on the imaging sensor and black edges at the corners of the frame, while the lens provides a non-circular (180° diagonal) view at the long end of the zoom. Constructed from magnesium alloy, the lens also features three ED glass elements, 2 aspherical elements and a Nano Crystal coating to reduce ghosting and flare. The AF-S Fisheye 8-15mm f/3.5-4.5E ED is also dust- and splash-proof, with a fluorine coating on the front element for easy cleaning. The lens also has an electromagnetic diaphragm to provide more precise and smooth exposure control, which can be particularly handy when shooting video. The AF-S Fisheye 8-15mm f/3.5-4.5E ED is available from June 15th, priced at $1,249.95/£1299.99 – Australian pricing is still to be confirmed. Finally, there's the AF-S 28mm f/1.4E ED prime lens, an update to Nikon's venerable 28mm f/1.4D, which is now demanding some incredibly high prices on the used market. The latest in the line of Nikon's 'Gold Ring' f/1.4 prime lenses, the AF-S 28mm f/1.4E ED is forged from magnesium alloy and is dust- and weather-sealed. while the nine-blade aperture diaphragm has the potential to produce some gorgeous-looking bokeh. The design consists of 14 elements in 11 groups, with three aspherical elements and two ED glass elements to minimize chromatic aberration. Priced at $1,999.95/£2079.99 (again Australia pricing is still to be confirmed), the AF-S 28mm f/1.4E ED will be available at from June 29th.